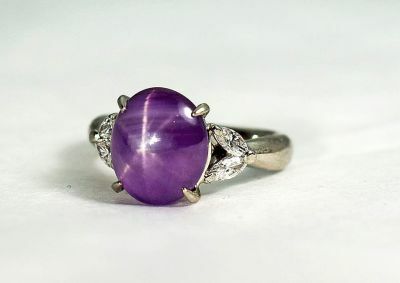 A beautiful vintage platinum ring featuring 1 oval cabochon medium powdery purple, slightly off centered 6 ray, star sapphire, est. 4.53ct and 4 marquise brilliant cut diamonds, est. 0.27ct (VVS-VS1 clarity & D-E colour).